There’s a story in the NYTimes (strangely in the Arts section) about a group of cognitive social scientists whose work supports the Franklin-Austen theory. In general it’s a good pragmatic policy to argue for what’s true, but there are many cases where uncovering the truth could lead to social ostracism or worse. Giordano Bruno became an expert on that; Galileo was his best student. To take a rough approximation of our ancestral environment, which presumably involved Dunbar-like population levels, our ability to reason irrespective of accuracy served as a valuable tool. We could use it to jockey for status, form coalitions, and to gain access to high value mates. We could lower the status of those who oppose us. We could do all sorts of things as we argue. But it is not primarily a truth tracking process; beauty often bests truth, perhaps only second in that respect to ridicule. But don’t be too funny, since the threat of ostracism carried greater weight in our evolutionary past–exile could mean death–and our ability to reason would not have served us well if it were to aim always at truths. Speaking truth to power is nice, but unpleasant facts might kill the messenger. As Omar says in the Wire or Emerson said in Concord, if you strike the king, you must kill him. Despite the fact that their work illuminates the weakness of reasoning, these cognitive social scientists are ardent deliberative democrats in the tradition of Jurgen Habermas and John Rawls. They believe that guided by the proper rules, democratic debate is the best form of government. This isn’t for moral reasons, they conclude, but for epistemic. When groups deliberate, it’s implied that their cognitive biases cancel each other out. He and Ms. Landemore suggest that reasoned discussion works best in smaller, cooperative environments rather than in America’s high-decibel adversarial system, in which partisans seek to score political advantage rather than arrive at consensus. Because “individual reasoning mechanisms work best when used to produce and evaluate arguments during a public deliberation,” Mr. Mercier and Ms. Landemore, as a practical matter, endorse the theory of deliberative democracy, an approach that arose in the 1980s, which envisions cooperative town-hall-style deliberations. Now this is all from a newspaper story, so there’s a lot jam packed into a thousand words, even less on this application of the theory to politics. I don’t know if they mean groups are epistemically more efficient at discovering facts or at expressing values. It would be misguided to say groups deliberate to find moral truths. At any rate, because they’re academics, they immediately apply their findings to institutions of immense power. I love this move. Behavioral economists and psychologists mastered it in the last decade. Take a finding such as how best to organize a cafeteria–nudge salads in front of deserts!–and then apply it to federal governance at once on everyone. These people are power hungry management consultants looking for clients in the state. They want to call themselves scientists or philosophers but instead they should be much more modest and find jobs at McKinsey on how best to organize a focus group. Any advertiser, not just that wily Ogilvy, will tell you that the worst form of advertising would be to provide an objective list of reasons why your product is better than its rivals. It is far more effective to have an amiable talking gekko or an overly cheerful siberian tiger explain one benefit your product offers. Persuasion requires an odd kind of reasoning. Entrepreneurs know this as well because it is very difficult to introduce a new product. In addition to his thoughts on the king, Emerson also remarked that if you build a better mousetrap, the world would beat a path to your door. He obviously didn’t run a VC or a start up in a market against vested interests. Unless innovators have invented a cure for cancer, where the demand is obvious and instant, most of them have to create markets in addition to products. A rollout has to happen in a certain sequence. 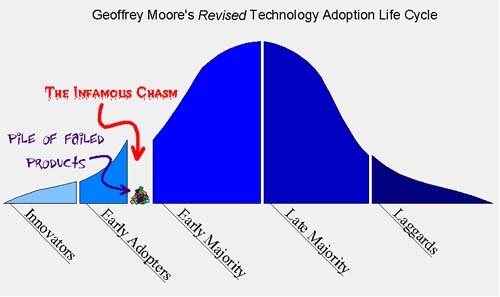 If the bottom of this graph represents time, adoption occurs first with the visionaries on the left side who become evangelists for the earlier adopters, a somewhat avant-garde crowd on the lookout for what’s new. The perilous chasm is the space between these enthusiasts and the mainstream. Very few products make it across. If rule sets in governance are a kind of technology, imagine how hard it is to introduce new political orders. Freedom of conscience was introduced into the political market by William Penn in a colonial backwater in 1682, far away from the burning intolerance of England. But the early adopters were evangelists–literally–and the success of the policy created a cascade throughout the colonies and eventually back to Europe. Again, as in Facebook’s rollout, in this story you will not find explanations involving deliberation and reasoning. Instead you find search, experimentation, and the snowball. Whereas entrepreneurs have to persuade customers to use their new products, democracies get to impose them on everyone at once, the willing and unwilling alike and in one-size-fits-all quantities. Focus groups are bad enough in the market. Design by commitee rarely works. But this tactic is even worse with public goods, where the success and failure of a new policy can involve potentially great harm to an entire public. I bring this up on a blog about political theory because I’m very skeptical about my ability to convince the rest of the world that competitive governance is a good thing. No amount of deliberation in a town hall will alter that. I take very seriously the infallibility of reasoning. And if we’re trying to innovate new forms of governance, we can’t rely on suped-up focus groups. But that’s okay, because we’re not going to have to. Fortunately new technologies don’t wait for juries to reach a consensus. 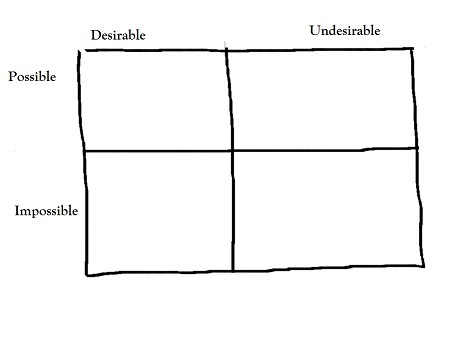 Where do you think most the world fits in this matrix? I’d guess in the impossible and undesirable camp. It would be a great waste of time to argue with them. The real trouble-makers are those who think it’s both possible and undesirable. But even so, these are the last people we want to waste our time reasoning with. If we must engage with them at all, I propose that instead of trying to convince them it’s desirable, we try to convince them it’s impossible. While they live under that illusion, we will build in peace and hatch a plan on how to develop our first customers. Then we’ll snowball out like William Penn before us.